In a medium saucepan, add in all the ingredients except the eggs and bring to boil. In another saucepan, add enough water so the eggs will be fully submerged inside. Place one egg inside to test. Bring the water to boil and lower to simmering temperature. Set your timer to 6 minutes exactly. Gently add in eggs (use a strainer if necessary) and stir them around with a spoon for about 2 mins. This will ensure the yolks set nicely in the centre. Let them simmer in the water for another 4 mins. Remove the eggs immediately from the pot and transfer them into a bowl of iced water. Let them cool for about 5 – 10 mins before peeling. Crack the eggs and peel them in the iced water. The shells will come off easily. 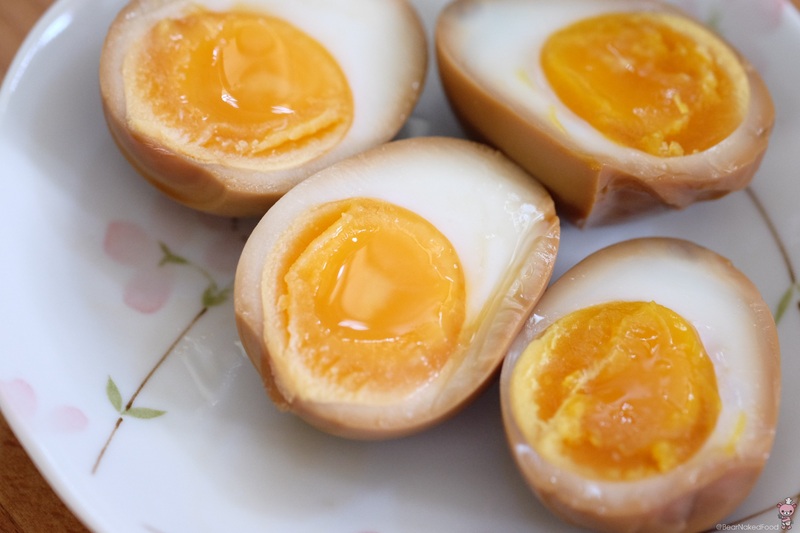 Place the eggs in a container and pour the cooled marinade until they are fully covered. Cover and let them hang out in the fridge for at least 4 – 12 hours. Take the eggs out and use a clean knife or string and cut them into halves. Eat them as a snack or serve with your favorite ramen, noodles or rice bowl. *The marinade could be reused and keep for up to 5 days.